It is not a wig or a treatment! We guarantee quantity and density of hair permanently for life. 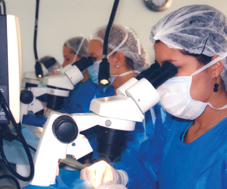 The Clinic includes a group of plastic surgeons and specialists in micrografting. They have all been using the Dulcoff method since 1992. Results guarantee a natural look. There is no possibility of scar formation (cheloid and hypertrophic scars), therefore there is no contra-indication for new implants. There is no possibility of postoperative vascular problems. We are able to graft an important amount of hair in each session. 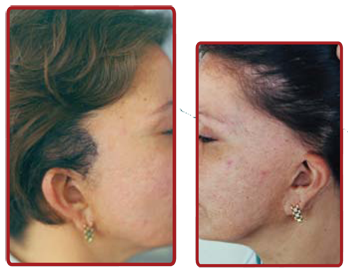 There is no risk of hyperpigmentation or hipopigmentation (patches) on the bald area. Postoperative bandages are not necessary. Patients do not have to stay at the Clinic. In fact, they can go to work next day. Micrografting does not require follow-up treatment. Eyebrow, eyelash, and moustache reconstruction. 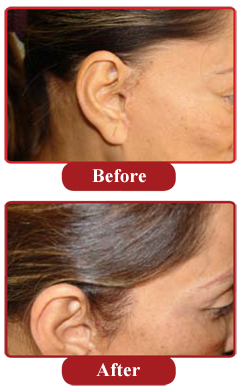 Correction of hair grafting with doll-hair look (Punch grafting). 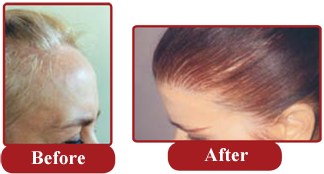 Treatment of female androgenic alopecia. 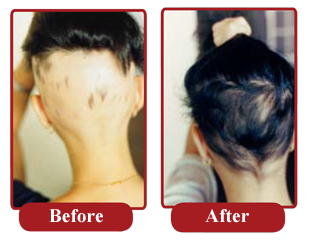 Treatment of alopecia due to burning, and scalp injury. Scalp reduction and scalp lifting procedures. Galeoplastia and lifting of the cuero cabelludo. Reconstrucion of the beard and the whiskers. The group is directed by Dr. Domingo Mata Coffi, plastic surgeon with studies in Venezuela, Europe, the United States, and Brazil. He is a member of the Venezuelan Society of Plastic and Reconstructive Surgery, Jaw and Facial Surgery, and Burn Injuries. Dr. Domingo Mata Coffi is also a member of the Latin American Federation of Plastic and Reconstructive Surgery, the International Society for Burn Injuries, the American Society of Hair Restoration Surgery and certificated by the American Board of Surgical Assistants(ABSA), among other institutions. Hair micrografting is a technique used to correct female hair loss which does not respond to steroid treatments or medicines that stimulate hair growth. This type of alopecia can be corrected with microinjerto capillary provided when there are good own donor areas in the patient. This type of alopecia can always be corrected with microinjerto hair and when there are good donor areas of the patient. There are alopecia caused by traction of skin after facelift surgery or stretching, in which can appreciate depopulated area in both temporary regions and visible scars. Is a disorder characterized by the intentional invoice of the hair, can be found in both (children or adults), is indicative of severe psychological problems. Presents the voluntary milestones of hair, even occasionally can be pulled out with the teeth, which at the time is lost in the attacked area. For these patients perform hair transplant must be previously cured from the psychological point of view, otherwise relapse almost involuntarily. Once the patient has overcome his psychological situation, in the alopecica area can perform hair transplant to give density. Some cases of alopecia are product of facial lifting procedures: balding areas and scars may appear on both temporal regions. In some other cases, women hair line goes back, making their forehead seem wider than normal. 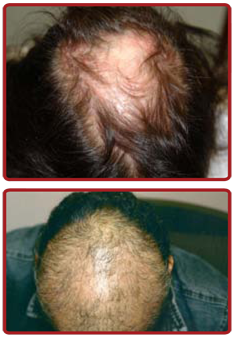 Hair micro grafting is also useful to correct this type of alopecia. Women may also suffer from injury alopecia caused by scalp burning. In this case, tissue expansions are used instead of hair micro grafting.